Ready your "Westsiders react to restricting public stairways like this..."-type jokes. 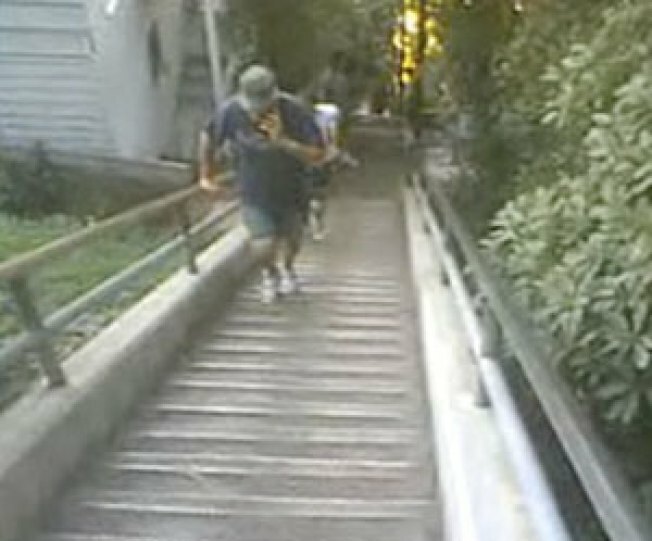 Both Santa Monica and Echo Park have public stairway concerns at the moment, but Santa Monicans continue to want more regulation of their Fourth Street stairs, while more than one local is mad as hell about gates put up on the Echo Park stairway connecting Mohawk and Effie. You'll recall that Santa Monica has a problem with exercisers clogging up the two stairways near Fourth Street and Adelaide Drive and stretching on a nearby median. The Santa Monica Daily Press now reports that parking restrictions and frequent park ranger patrols have curbed some of the congestion, but rascally exercisers are still doing lunges on the median once the rangers are out of site. In April, the Argonaut reported that the city was considering building new stairs in Palisades Park, and that's still on the table--City Council staff are looking into that option (although it doesn't sound pressing), as well as more parking restrictions, and closing the stairs at night. That last idea will involve LA because the stairs are on the city border. Meanwhile, according to the Santa Monica Daily Press, here's one crazy exerciser's excuse for hitting the stairs: "It's lean times. I can't afford a gym membership right now, so this is my gym." Meanwhile, in Echo Park, local stair enthusiast Dan Koeppel (he organizes the Big Parade, the walk through LA's stairways) noticed that the Effie-Mohawk stairs had been gated on both ends over the Thanksgiving weekend. No one knows why yet, or if the gates are public or private, although Councilmember Eric Garcetti's Head of Constituent Services Mitch O'Farrell called them "unauthorized," according to Eastsider LA. The blog also says the Mohawk end of the stairs sees a lot of tagging. Koeppel put out a call for action, and now Garcetti's office says they're looking into the origin of the gates and will expedite a report to the Board of Public Works if necessary. Oh, by the way, the gates aren't locked, but Koeppel, who says there are more than 20 closed off stairways in LA, writes on his blog, "[L]egally, stairs are public streets in Los Angeles. They should be maintained and respected the same as any street. The city has a responsibility to keep these thoroughfares open, and prevent them from being taken private, just as it does any residential street that happens – by quirk of fate and history – to also accommodate non-pedestrian traffic. Nobody should have to take the law into their own hands to keep a public asset within public grasp."